With today’s technology, brides and grooms are opting for a video wedding package as well as a photo package as a way to preserve their memories of the big day. 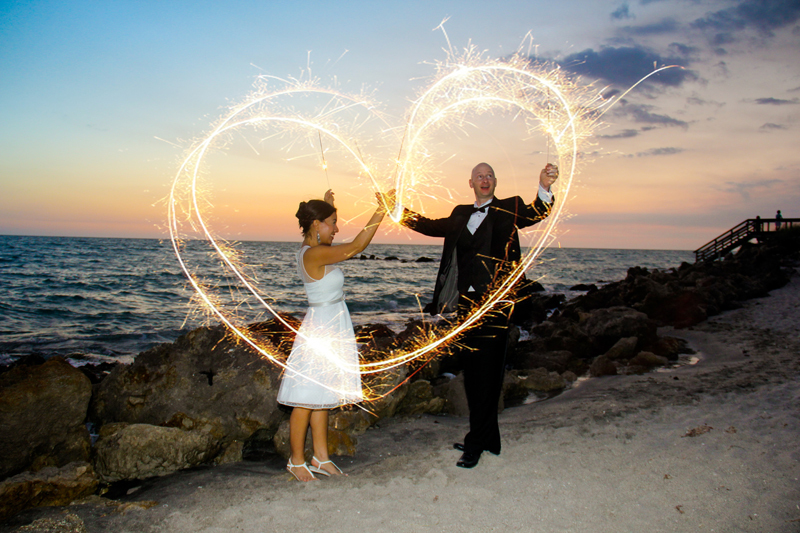 Many wedding photographers, from the Sarasota wedding photographer who will be filming your destination wedding in Lido Key to the New York shutterbug who will capture your wedding ceremony in Central Park, offer video options as a part of their wedding packages. However, in order to save money and avoid regret later on, there are a few dos and don’ts to consider when choosing wedding video package options. When it comes to capturing excellent wedding footage on video, it’s important to remember that one camera can’t possibly capture everything. This is especially true during the reception, where there is so much going on and so much action to capture that your videographer might miss some very important moments. While a second cameraman may cost a little extra, you won’t be sorry when you see the final edit of the video and realize how many different moments each camera was able to capture. If you don’t have room in the budget for a second camera, then consider setting up a stationary camera in the room at the reception while your videographer captures the rest of the action with a hand-held camera. There’s nothing more awkward than having a microphone shoved in your face at a wedding reception when you least expect it: that is, unless you have to watch video of it happening. While your friends and family certainly wish you well, (they wouldn’t be at the wedding if they didn’t,) this doesn’t mean you need thirty minutes of footage on your wedding video of them trying to think of something funny or clever to say. It’s also embarrassing for those who are put on the spot when they’re trying to eat their dessert or dance, especially when they see the video, so it’s best to forego this and leave it out of the\ footage altogether. If you truly want your friends and family to record you and your groom personal messages, then ask your videographer to create a separate video guestbook so that you can view these well wishes separately and so that those who appear in them have a bit more time to prepare what they’re going to say. Thanks to the advent of streaming video, people can now watch a video file from almost anywhere once it’s downloaded, whether they upload it onto a thumb drive to watch on their laptop or stream it directly to their TVs. This type of viewing has become so popular that you may even know some people who don’t even use their DVD player that often anymore. Offering your guests a digital copy of your wedding video makes it easy for them to view it when and where they want. Adding a digital file to your wedding video package shouldn’t be very expensive, and many photographers might even include it as a part of the basic package. Adding a digital file option will also make it easier for those who live far away to view the video instead of having to wait for a hard copy to be mailed out. While your mother might never tire of looking at your baby pictures, your other guests are going to get bored real quick if you include a thirty-minute video montage of you as a child to start off your wedding video. Cute gap-toothed smiles and awkward teen school photos are sweet and touching, but they are better saved for your wedding rehearsal dinner or shown as your guests arrive for the wedding, where there will be plenty of people around to share their memories. Creating the perfect video wedding package can be daunting, but keeping a few dos and don’ts in mind beforehand will ensure that you’ll want to share the results with everyone for years to come. Summary: Many wedding photographers, from the Sarasota wedding photographer who will be filming your destination wedding in Lido Key to the New York shutterbug who will capture your wedding ceremony in Central Park, offer video options as a part of their wedding packages. However, in order to save money and avoid regret later on, there are a few dos and don’ts to consider when choosing wedding video package options.